Things to do in Jordaan Amsterdam 2019, Including Full Day Guide! Are you planning a trip to the Jordaan? Here at Hello Amsterdam we’ve got you covered! With the best tips and things to do in Jordaan Amsterdam, a very picturesque part of town. The area is bordered by the Singelgracht canal and the Frederik Hendrikbuurt to the west; the Prinsengracht to the east; the Brouwersgracht to the north and the Leidsegracht to the south. The area is one of he most famous in Amsterdam and we can understand why. It is full of culture, shopping districts, interesting street art, beautiful sights and the embodiment of the local mindset better known as “Amsterdamse gezelligheid”. Take a stroll by the cute canals and architecture in the Jordaan. Everything in the Jordaan neighborhood is in walking distance so it is the perfect place to explore by foot. On a Saturday, start at the Noordermarkt and brows the stalls of the famous farmers market. On Mondays the market is full of antiques, vintage, art and curiosities, while you are there you can explore the beautiful Noorderkerk and stop at “De Winkel” for the best piece of apple pie in the city. On Saturday there is also another market in the area, the Lindengracht market on Saturdays has everything you could want. From flowers and curiosities to food, this is a market where locals and tourists come to get the best bang for their buck. After that visit the Anne Frankhuis, don’t forget to buy your tickets in advance though, the lines can be very long for those who want to buy a ticket at the door! Close to the museum you will find the Homo monument, located between the Westerkerk and the Keizersgracht, it serves to commemorate all homosexual men and women who have been prosecuted for their orientation. In the mood to shop? Then you are in luck, the Jordaan is full of good places to shop. One of the most famous shopping area’s is the nine streets. This is where you find all kinds of shops, restaurants, galleries and concept stores that are all worth a visit. But that is not the only shopping district in the area. 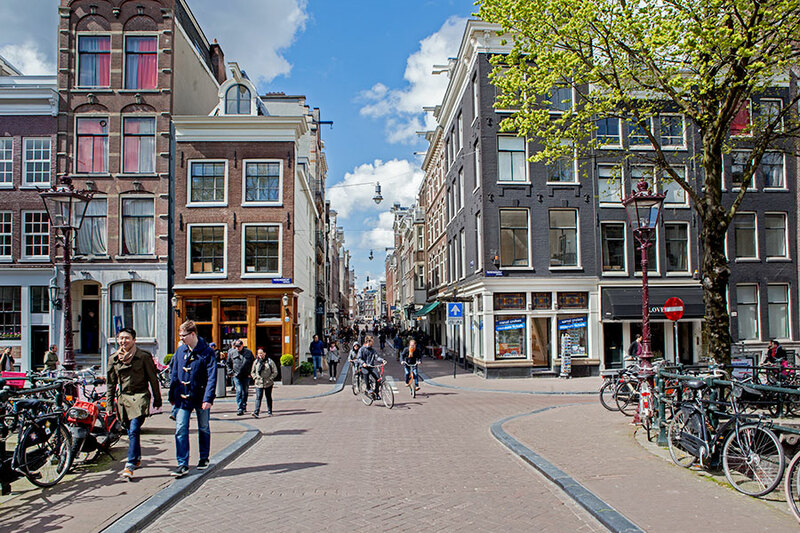 The Elandsgracht, The Royal Streets and the Haarlemmerbuurt are all perfect for people who like to browse and buy all sorts of things. End your visit to the Jordaan at Café Nol located on the Westerstraat for some old fashioned, Amsterdam nightlife. The Jordaan is also home to the oldest café in the city, Papeneiland at the corner of the Brouwersgracht and the Prinsengracht.